I can never resist a sale on Pillsbury crescent rolls. Scratch that. I can never resist a sale on ANYTHING Pillsbury. I’m a little obssessed with their products! I debated on what I should make with the cans of crescent rolls I picked up a few weeks ago. I thought about making croissants, but wanted to do something a little different. The next idea was caramel potstickers. However, my caramel turned out like soup so that wouldn’t work. Lastly, I decided to use that jar of Reese’s Peanut Butter Chocolate spread in my pantry and make some Reese’s Peanut Butter Potstickers. Three’s a charm! This recipe only makes four potstickers, but they are quite large so one is usually enough to fill a person up. If you have more to make, simply double the recipe. It’s only three ingredients! After unrolling your dough and separating into four rectangles, press the seals together so it will hold. Side note – does anyone else jump when the can opens? It scares me every time. 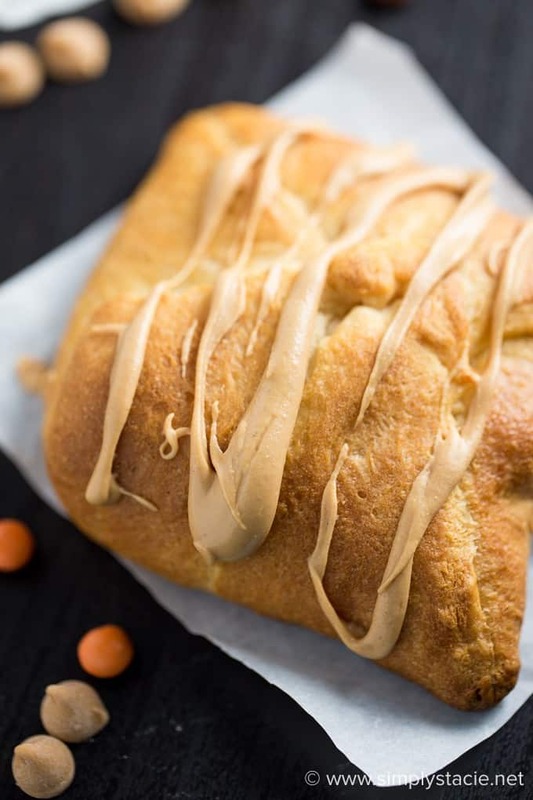 Add one tablespoon of the peanut butter spread to the centre of the dough and the fold up the four corners, pressing to seal. 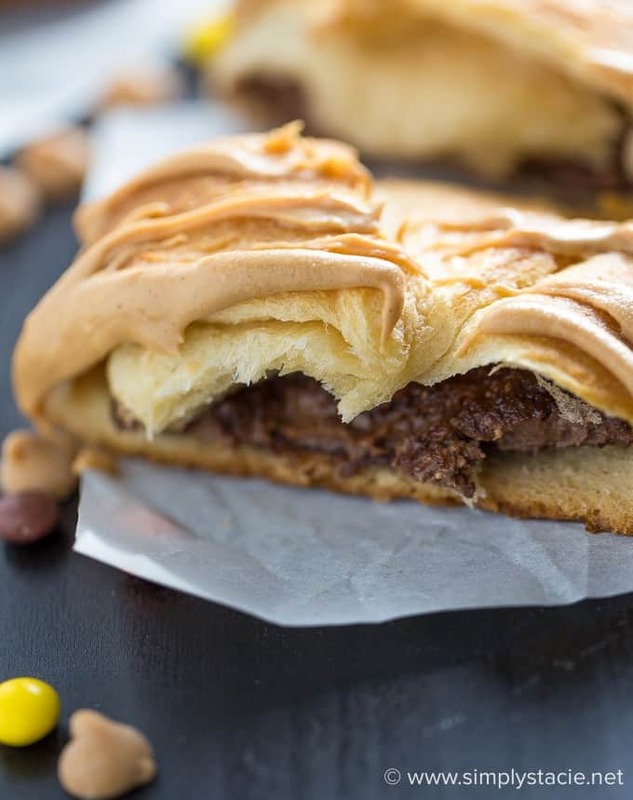 It’s like a little dough parcel with a chocolate treasure inside. They only take 15 minutes to bake. Keep an eye on them because I find they burn easily. I like to take them out as soon as they turn golden brown. The topping is simply melted peanut butter chips that I drizzled on with a spoon. Do this while the peanut butter is still hot so it’s easier to drizzle on. After it hardens, it’s impossible to use! 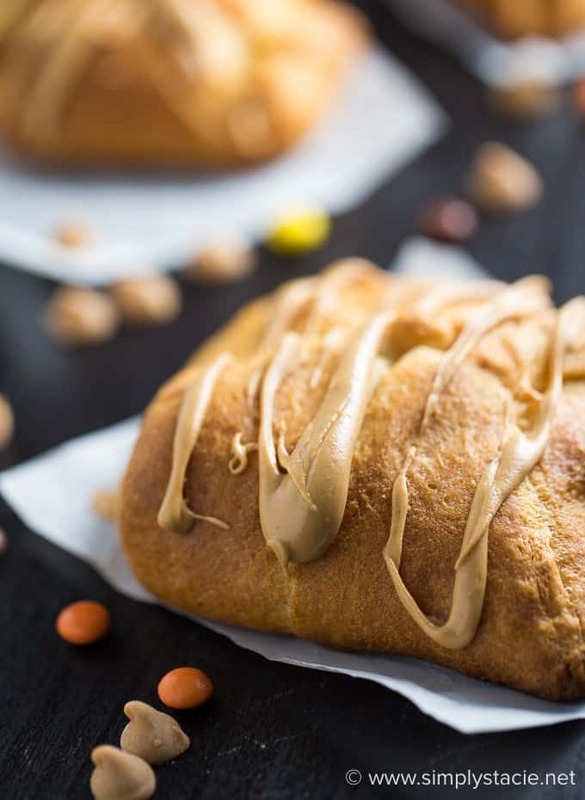 Inside that buttery package is rich and sweet chocolatey peanut butter goodness. They did not last long and my family wanted me to make more. I used the last of the Reese’s spread on this recipe though so unfortunately couldn’t oblige! Does this dessert look like something you and your family would enjoy? 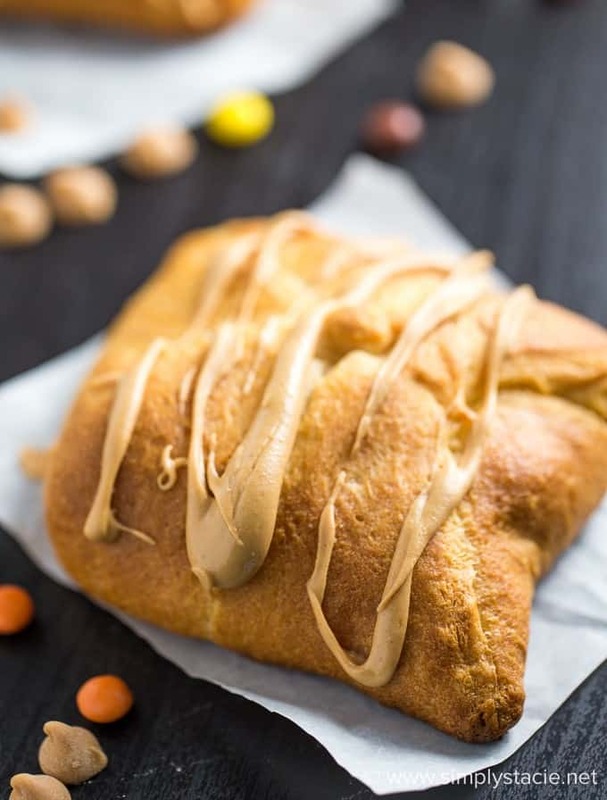 Buttery parcels filled with rich and sweet Reese’s Peanut Butter Chocolate spread and topped with melted peanut butter chips. Decadent and delicious! Preheat oven to 375. Spray a cookie sheet with cooking spray. Unroll crescent roll dough and separate into four rectangles. Place on cookie sheet. Press perforations to seal together. Add 1 tbsp of Reese’s Peanut Butter Chocolate Spread to the middle of each rectangle. Fold each corner of dough to the middle and press to seal. In a microwaveable bowl, melt peanut butter chips in the microwave for 1 minute on medium. Stir. Return to the microwave for an additional 15 seconds on medium. Stir. Continue doing this until melted. Mine was melted at 1 minute 15 seconds. Drizzle melted peanut butter chips over the potstickers with a spoon. Serve hot. This dessert looks so easy to make and I love how pretty it is! I will have to make these Potstickers and share them with my family! 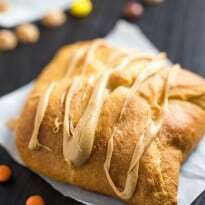 I love anything with peanut butter, these look delicious. I am going to try these tomorrow! They look really easy and appealing. Thank you for the recipe! This is a great idea! I’d love to try this! 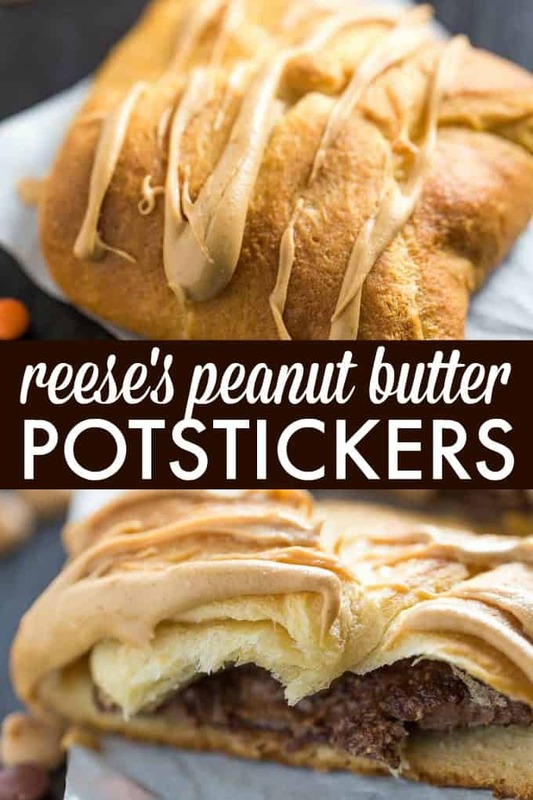 This is an interesting treat, great for someone who likes Reese’s Peanut Butter. I would love to try this with chocolate spread and chocolate chips. Thank you for sharing this recipe. I’ve never tried anything like this……the guys would love it! Wow, is all I can say. These look amazing. The crescent rolls are so versatile. And yes, opening them scares me every time. 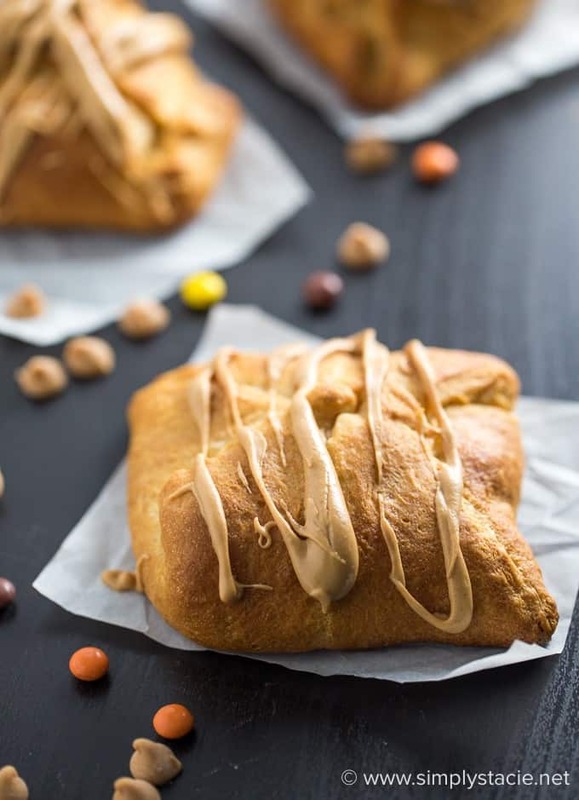 Peanut butter is one of my favorite foods, so these look amazing! I need these NOW! Thanks for linking up at the Meet Up Monday Link Party! Hope to see you again next week! That’s quite the interesting idea! Visiting from Meetup Monday! 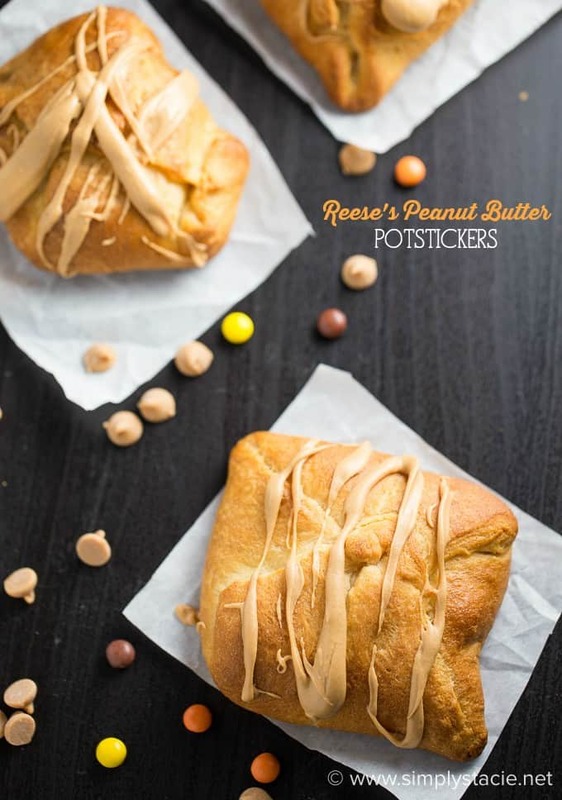 These peanut butter yummies look so good! Your Potstickers look like a fun treat! Hope you have a very special Valentine Day and thanks so much for sharing with Full Plate Thursday. Wow these look AMAZING! Thanks for linking up to Meetup Monday! These look SO yummy and simple to make. Thanks for sharing at MeetUp Monday! I have to remember to pick up some of these pre-made doughs and pastries! OMG these look amazing! My husband would absolutely love these; I’m definitely going to make them for him! Thanks so much for sharing this at the Creativity Unleashed link party, they were my Rockstar pick of the week!